Isn't the Earth's biggest carbon sink diffusion into the global ocean? This slows the increase in atmospheric CO2, but with the horrible cost of ocean acidification, killing marine organisms. Coral reefs are dying off in many places. Movement of carbon between land, atmosphere, and ocean in billions of tons per year. Yellow numbers are natural fluxes, red are human contributions, white are stored carbon. The effects of volcanic and tectonic activity are not included. Coral reefs are dying off mostly because of Global Warming. Thanks sincerely Art. Nice graphic and quantifying of the problem. I'm sure that my quick off the top list is incomplete. Can you think of more? More frequent heatwaves with more extreme highs. These are going to be especially deadly to people who have no access to air conditioning. Fewer cold snaps with higher lows...can you hear the mosquitoes buzzing? Our future grandchildren hate us. Well...that's a relief, at least; I don't expect to have anymore grandchildren. I hate the cold! We had 1 nice day and now it's cold again! Of Coarse in the Summertime, I'll hate the heat! I'm a fair weather person! I keep saying Spring is near. I hate the cold! We had 1 nice day and now it's cold again! Of Coarse in the Summertime, I'll hate the heat! I'm a fair weather person! I keep saying Spring is near. Climate change is all about unfair weather. 3) Hurricanes & flooding will be more intense. Part of why we moved to Idaho, your points 2 & 3. And as for point 1, even though we live less than a 2 hour drive from Yellowstone and Grand Teton National Parks and have been here for the better part of 2 winters we have yet to see a real blizzard. I'm sure that will change at some point, but so far the winters haven't been near as bad as people have warned us about. me as much as mt Children and Grandchildren! So I hope Science can fix the mess we are in! I hope Science can fix the mess we are in! Science is pretty good at figuring out the mess we are in. Snow; snow; go away; I don't like you anyway! Local hike, day before yesterday. Winter aconites in the old city cemetery in Malmö. Yesterday the midday temperature in Malmö was almost 14 oC. We have had extremely little snow here so far this winter, and rarely freezing temperatures. Winter aconites and snowdrops are in full bloom. During a live broadcast in Greece, residents screamed as they watched the local landmark stone bridge collapse as overflowing river flood waters smashed into it. <<During a live broadcast in Greece, residents screamed as they watched the local landmark stone bridge collapse as overflowing river flood waters smashed into it. Other bridges and buildings on the island were damaged. Chris: I don't like the heat of Summer either; nor the forest fires! But i believe that fire control can be accomplished by selective planting to a large degree! PS! To each his own! I'm glad you like snow! You can't selectively plant to control wildfires, though. Not in thousands of square miles of wilderness. The best protection against such fires is an absence of dry fuel, which means good snowpack and lots of spring snow. Chris: I don't like the heat of Summer either; nor the forest fires! But i believe that fire control can be accomplished by selective planting to a large degree! It's going to work out well. I just give my opinion and nothing more! I don't claim to have the answers! I'd send you some of our snow but refrigeration is too costly! Our weather report says that it will get colder and colder in southernmost Sweden over the next weeks. Maybe we, too, will get snow in mid-March. February 11 - 25, 2019 NASA Earth Observatory images by Joshua Stevens, using data from the Level 1 and Atmospheres Active Distribution System (LAADS) and Land Atmosphere Near real-time Capability for EOS (LANCE). <<Unseasonably warm temperatures swept across the United Kingdom and much of Europe in February 2019. The month started with snow and freezing temperatures in the United Kingdom, but provisional statistics from the UK Met Office indicate February 2019 was the second warmest February on record for the country. England, Scotland, and Wales all recorded their warmest meteorological winter days and hottest February days since record-keeping began in 1910. The maps on this page show land surface temperature anomalies for February 11-25, 2019. Reds and oranges depict areas that were hotter than average for the same two-week period from 2000-2012; blues were colder than average. White pixels were normal, and gray pixels did not have enough data, most likely due to excessive cloud cover. This temperature anomaly map is based on data from the Moderate Resolution Imaging Spectroradiometer (MODIS) on NASA’s Terra satellite. 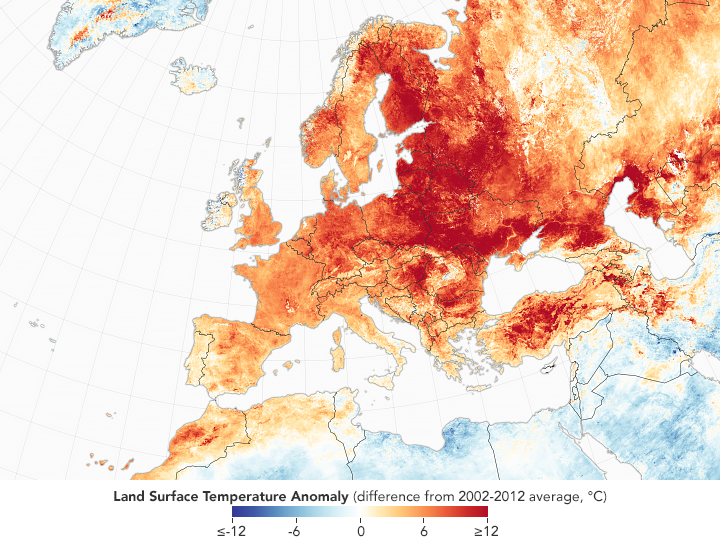 Note that the map depicts land surface temperatures (LSTs), not air temperatures. LSTs reflect how hot the surface of the Earth would feel to the touch and can sometimes be significantly hotter or cooler than air temperatures. Rain, rain, rain. Photo: SVT. Right now our weather looks like this. And it's going to stay this way for at least a week. Just back from a day of mushing. One more reason to keep winter going a bit longer! We got about 10" inches of snow overnight; real fine powder! (Hope the wind doesn't pick up or we will get a good blizzard); anyway, I cleaned the walk and drive with my little snowblower! Sure is a chore for this old man! Chris; my friend, when I was younger I liked the snow also, but no more! I'm happy looking at the snow out of mt window!